Query Plan in the developer console can help to speed up SOQL queries done over large volumes of data. This is such a powerful tool when dealing with bad performance. Developer can use this tool to optimize and speed up SOQL queries. All we need to use is the indexes in the filter. it is an audit field (CreatedDate, SystemModstamp). If we are using filter on custom fields, then we are using index if that field is marked as Unique or External Id. Without indexed filter, the query will not be considered for optimization. So does that mean if I use filter which is indexed, I am safe and my query is optimized? Answer is Yes and No. For a Standard index, the threshold is 30% of the first million targeted record and 15% of all records after that first million. In addition to that, selective threshold for a standard index maxes out at 1 million (which is only possible if the total number of records is 5.6 million). For a Custom index, the threshold is 10% of the first million targeted record and 5% of all records after that first million. In addition to that, selective threshold for a standard index maxes out at 333,333 (which is only possible if the total number of records is 5.6 million). So if the filter exceeds the threshold, then query will not be considered for optimization. Here I am not using any index field, Field column is blank, Operation Type is TableScan and cost is > 1. 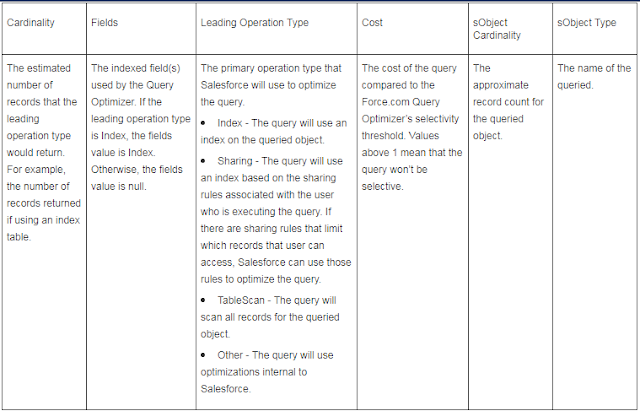 Anytime the cost of a SOQL query is greater than 1, it means it is not considered for Optimization. Here I am using custom index field (External_ID__c) which is there in the Field column, Operation Type is Index and cost is < 1. 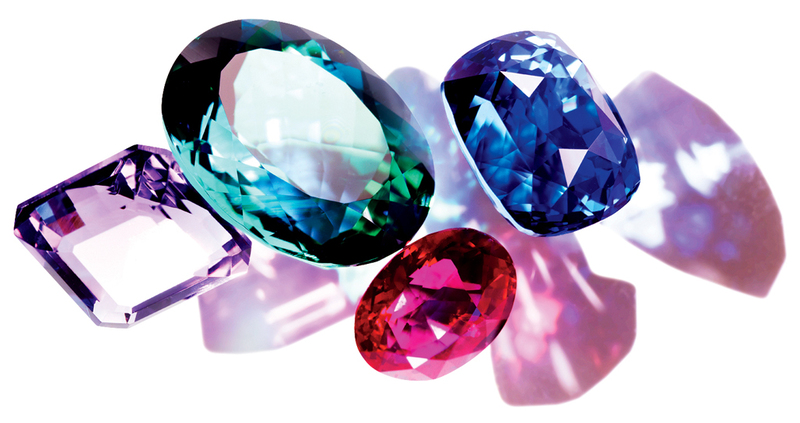 Since we have one cost which is less than 1, that will be used to optimized the query. Here I am using custom index field (External_ID__c) but still the field column in blank and Operation Type is TableScan and cost is > 1. So definitely this query is not optimized. But Why?? Here I have used second indexed field(Contact_Type__c) in the query. 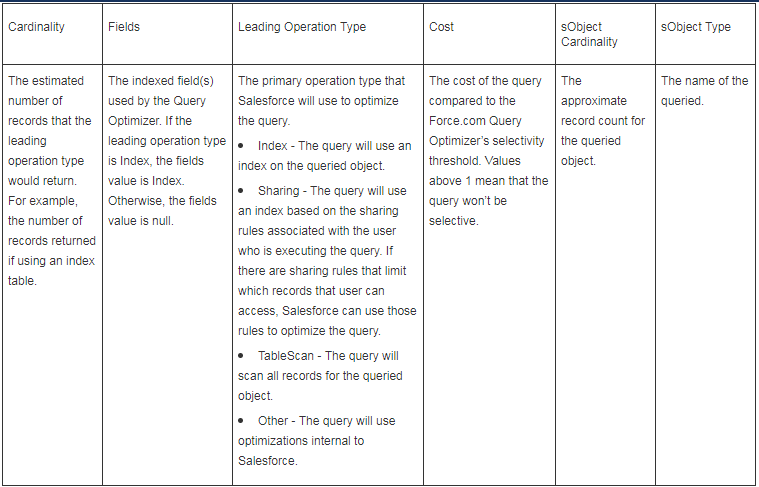 In this scenario, Salesforce will select the plan with lowest cost. Here I have used second non-indexed field(Client_Status__c) in the query. That is why only one indexed field in the result. Here I have used second non-indexed field(Client_Status__c) in the query with or condition.When using OR condition, all filters must be indexed and under the 10% threshold. Here even though I have used indexed field(contact_type__c), but still the query is not optimized as you can see the lowest cost is also greater than 1. The reason is that here the finding variable 'Customer' is resulting more than 10% of the full table. Here I have changed the binding variable to 'Advisor' and resulting data count is less than 10% of the full table. That is why this query is optimized.